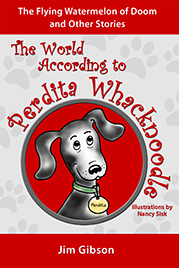 Since Perdita is convinced that dogs are superior to humans, she thinks humans exist to take care of dogs. So, she thinks of these humans as her staff. Laura is in the fourth grade at Morningside School. She was minding her own business when suddenly Perdita stated bombarding Laura’s brain with those “thought particles” and telling Laura all kinds of stories and dog-thoughts. 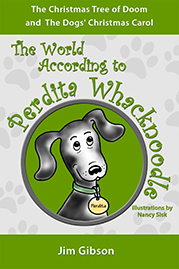 You’ll probably agree that it’s a good thing Laura DID write all this down, because Perdita’s stories seem to give us a revolutionary view of what dogs really think. Jim worked with Laura to get Perdita’s stories made into books so other dog lovers could share all this important information. 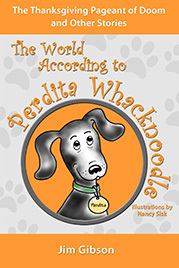 Nancy illustrated the books, to give readers a good idea of what Perdita’s world is like. The good news is that all Perdita’s thought-particle bombardment does not seem to have damaged Laura’s brain, and Jim and Nancy think that working with Perdita’s stories has made them smarter. At least that’s what they claim, and Perdita agrees.